Last month we found ourselves in the heartland of America with a look at a crucial Big 12 college football matchup, and for the December Pléiades 1 – SPOT 6/7 Stadium of the Month we head to the East Coast to the site of the 119th Army-Navy football game in Philadelphia, Pennsylvania, i.e. Lincoln Financial Field. 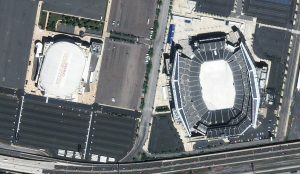 A 50-cm color image of Lincoln Financial Field in Philadelphia, Pennsylvania, USA collected on July 8, 2018 by Pléiades 1A; and then a 1.5-m SPOT 6 image of the same stadium collected on October 27, 2017. These images have custom processing and color balancing applied by Apollo Mapping. PLEIADES © CNES 2018, Distribution Airbus DS. SPOT © Airbus DS 2018. 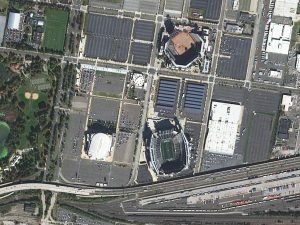 About the Venue: Located on the southern side of Philadelphia, construction on Lincoln Financial Field started on April 3, 2001; and was completed in time for its opening National Football League (NFL) game between the home team Philadelphia Eagles and the Tampa Bay Buccaneers on September 3, 2003. Built at a cost of $512 million versus just $63 million for the stadium it replaced, Lincoln Financial Field can hold 67,594 plus fans and features a Bermuda grass field sourced from New Jersey or North Carolina. Fun Factoids: (1) The first Army-Navy game dates back to 1890 where Navy beat Army 24 to nothing. The 119th edition of the matchup takes place at 11am Eastern on December 8th. Navy holds the edge in the matchup, with a 59-49-7 (wins-losses-ties) record. (2) While only occupying a space a half acre larger than the old Veterans Stadium, Lincoln Financial Field has 1 men’s bathroom for every 58 men; versus just 1 bathroom for every 319 men in the old stadium! (3) Naming rights for the Eagles’ stadium were sold to Lincoln Financial in June 2002 for $139.6 million over 21 years, which according to this list makes it one of the most expensive naming rights deals every signed for a stadium. This entry was posted in The Geospatial Times and tagged featured products, Pleiades 1, Pléiades 1 Stadium of the Month, The Geospatial Times by Apollo Mapping. Bookmark the permalink.